Gordon Hayward and the Celtics are getting into rhythm, and that could be trouble for the rest of the Eastern Conference. The Celtics’ offense has exploded recently, posting at least 118 points in each of their last three games, all three of which were victories. Only the Celtics have a current streak of that nature in the NBA. For the franchise, Boston has accomplished the feat for the first time since March 1994. 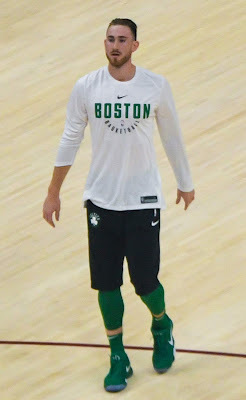 Gordon Hayward was the most valuable player on Saturday’s 118-109 win at the Minnesota Timber-highlighters, as Hayward became the first Celtic since Kyrie Irving in 2017 to attempt double-digit free throws in one contest. Gordon’s performance off the bench was impressive, especially on the second night of a back-to-back. He became just the third reserve in NBA history to score 30 points, grab nine rebounds and dish out eight assists in a contest. In addition, the Celtics’ start to the season is not anywhere as bad as it seems. According to ESPN’s Pythagorean formula, their expected record should be 15-8 instead of 13-10. Boston’s win differential also stands at +4.4 per game, and that ties the Celtics with the Golden State Warriors. The differential ranks as the third-best one in the Eastern Conference. The Celtics’ schedule has been road heavy thus far, and they have only one fewer home loss than the Milwaukee Bucks and Toronto Raptors. Boston’s offense recently moved from the basement of the league to middle of the pack. The C’s are also in the top five in turnover ratio and top 10 in assist ratio, and of course, the Celtics’ perennial powerhouse defense ranks second in the league. Although Brad Stevens does not seem to care about his starting lineups, both of the Marcuses have ignited the Celtics to start off the game. Marcus Morris is 4-1 in his five starts this season, which coincidentally are the team’s last five games. Marcus Smart is 3-0 in his three starts of the 2018-19 season, and – you guessed it – it is the Celtics’ last three games, the team’s three highest-scoring non-overtime performances of the season. The Celtics are fortunate to finally get some rest in December, as they do not play until Thursday. The long time off between games gives Jaylen Brown more time to rest. With the Celtics being 4-0 without him this season, he may lose his spot in the starting five after starting each of his first 19 contests this season. His low back bruise has sidelined him for each of the last three games, and who knows if he will be a part of a trade package this season or in the offseason. There remains a logjam for Stevens to deal with when the team is fully healthy, but for the time being, the Celtics will try to ride the highs of the rollercoaster start to their season. Unfortunately, a 2018-19 season in which Irving is throwing alley-oops to Anthony Davis is a pipe dream, and this Boston team is now looking like a slight underdog to the Kawhi Leonard-led Raptors and of course, the Warriors. The slightly lower expectations for this Celtics squad could take the pressure off them and allow the team to hit their potential. Saturday was a big step toward doing so.